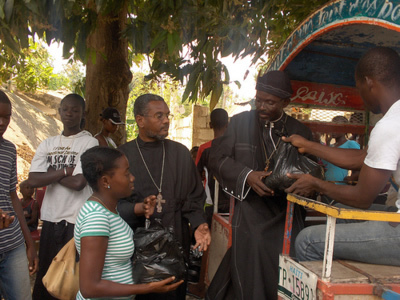 distribute aid to parishioners. April 2010. The parable of the rich man and Lazarus fits Haiti so well, with so many nuances. The struggles and contrasts between rich and poor are reflected in everything. There are at least three contrasts of rich and poor. First, the Haitian elites vs. the rest stand out. The upper class oligarchs, generally light-skinned and Francophone, many of whom robbed the country, have caused suffering, but have also provided leadership and intellect, and many now have suffered as well. Second, there is the contrast of those who suffered in the earthquake (mostly but not entirely poor) vs. those who had better houses. And now third, there is also a contrast between rich internationals vs. poor Haitians. There are foreigners like me, who drive past the tent cities into a most bearable hotel, and work here for international agencies. So what did Jesus want the rich man to do for Lazarus? Clearly Lazarus went to heaven and the rich man did not, and the rich man was supposed to have helped Lazarus, but how? Should he have given him food, money, and housing? Would that have created perverse incentives for Lazarus not to work? Or should he have given him an education or a microcredit loan? Or created conditions favorable towards agriculture? Or addressed interest rates? You see my – our development frustration. What to do with this dreadful scenario is not clear at all. Lazarus, the poor, while deeply wronged, are in some cases now seeking to take advantage of the earthquake, using the incentives created in the camps, and there is a great deal of violence reported in the tent cities. Finally, I struggle to think of the people in tent cities I pass as the same as myself, and try to understand what their life is like. I hope not to act like the rich man toward Lazarus. I am reminded that my grandmother used to pray not to be rich. My first physical impression from the air was of erosion, not earthquake. When you are landing, you see denuded mountains that look like all the trees are missing. Then you think they are snow covered, as there are huge patches of light color, and you eventually realize that the erosion effects are so huge they look like snow from the air. Erosion is a consequence of poverty and uncertainty. Poor farmers, not sure the land is theirs, farmed it to get the most out of it, used chemicals, did not conserve. Lacking fuel, the urban dwellers chopped trees. This allowed water to run off without any trees or bushes to slow it down. So the forest is gone and the topsoil level is also gone in much of the country. The earthquake damage is as awful as you have seen on CNN and very uneven. Oddly some buildings are pancacked while next to them were palatial huge buildings that were not destroyed. Throughout the capital, destroyed houses stand next to structures that are intact. There were very different building systems, and clearly some structures suffered very little. The US Embassy had a few tiles fall from the ceiling. The crushing amount of earthquake debris is being carted away, in many cases without observing minimal safety protocols. At first the port owner (a wealthy business man) wanted it dumped into the bay to increase the size of the jetty and this was taking place without any sorting – debris, oil, body parts, all were dumped into the water. Children scavenged, and the dumping occurred as there were scavengers still in the trucks. It was a mess. US agencies prevailed with a contract to sort debris and dump clean debris, while disposing of body parts and oil appropriately. And now the port owner does not want the debris in the bay, he wants instead to destroy a nearby wetland, so he is seeking to divert trucks to another place. Also throughout the country are piles of rubble brought to shore up eroding soil. Many tent cities were visible from the air when I landed. Blue tents are UN, beige ones - USAID. The tent cities are of great concern to the international community. There are over 1000 in the country and 600 in Port-au-Prince alone. Some arose spontaneously and some were organized by various agencies. More and more people join them daily and this is a major concern. There are over a million people in them. Initially, those whose houses collapsed left the capital and went to the countryside. They stayed with relatives but some tent cities were formed. As time went on services were provided to tent cities in the capital first and more and more people gravitated back to the camps. Now there are rumors that everyone in a tent city will get a new home. The services provided by international agencies are also quite significant – food, potable water, sanitation, schools, some recreation, some medical care, and others. Even though there is violence in the camps and frustration for many people in the countryside conditions are better there. So there has been an influx of people seeking shelter in the camps. Camps are crowded and there are now increases in injuries from camp life. There are rumors of increased violence against women and children. The medical personnel report dramatic increases in burns since more and more people are cooking on open stoves in close quarters. There are widespread rumors of loups garoux (werewolves) preying on people. This is just a symptom of the extent to which people feel insecure. The Haitian government wishes to disperse people either back to what they used to call home, or better still, to the less settled countryside, and will be offering various inducements to leave, but falling far short of a totally built new home. Once the unrealistic aspect of the rumors is absorbed, people in camps may become restless and angry. The camps are the focal point of relief efforts and this is a possible tension with the Haitian government’s desire to move people out. Camps can last 20 years and more, for example some Armenians still stay in a post-earthquake small house and keep their registration in Spitak in the hopes of some benefit.